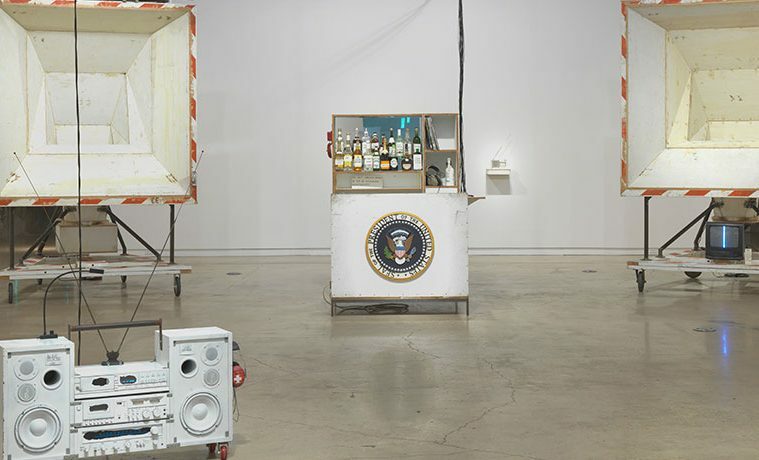 Installation view, Tom Sachs: Boombox Retrospective 1999–2015, The Contemporary Austin – Jones Center, Austin, 2015. Courtesy Tom Sachs Studio. Photograph by Genevieve Hanson. 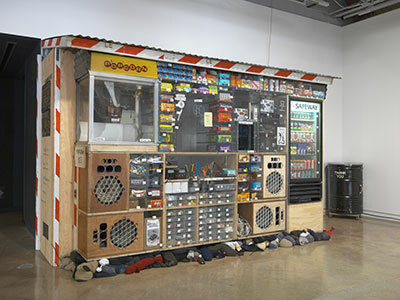 Tom Sachs, Bodega, 2014. Mixed media. 90 x 122 x 40 inches. Installation view, The Contemporary Austin – Jones Center, Austin, 2015. Courtesy Tom Sachs Studio. Photograph by Genevieve Hanson. As tens of thousands of visitors descend on Austin this month for South by Southwest (SXSW), and the city braces for the annual mayhem and debauchery they will bring with them (not to mention the $200 million-plus in economic impact), it’s easy to understand why any business or institution with half a mind set on growth, expansion, increased participation, or simple relevance would do anything it could to tie in to the festival. Put in more polite terms, organizations that want to engage with Austin, its history, and its driving forces, would be foolish not to take advantage of the long-running festival’s inescapable cultural gravity. The Contemporary Austin is doing so on all fronts with its current exhibition, Tom Sachs: Boombox Retrospective. Tom Sachs’ work, like the music he references and the festival his exhibition engages with, is fraught with questions of shifting authenticity, branding, consumerism, and credibility. The same marketing tactics the artist brings attention to through his art are conscripted to elevate his own work. The Contemporary itself implements those tactics in curating the show and its partnership with SXSW. However, despite these ostensible turn-offs, Boombox Retrospective flexes an intensity, humor, and quick-witted intelligence (attributes also shared with hip-hop, punk, and indie music) that render the marketing ploys a point of interest rather than purely manipulative constructs. The first floor of the Jones center is scattered, serving up a smorgasbord of Sachsian delights rather than the concentrated thematic exhibition one would expect from its title. Viewers are indeed met with Toyan’s, a megalithic 8 by 12 foot handcrafted stereo playing tunes at a volume considerably lower than its assumed capabilities, but after this initial boombox, things fray around the edges. Also on exhibition on the first floor are some of Sachs’ video works, including his well known Ten Bullets guide for studio assistants (check it out on YouTube); a cast bronze tower of car batteries; an absurd but functional bodega where one can buy $7 non-gmo popcorn, Magnum condoms, V8, and Whatchamacallit candy bars; a set of more moderately sized hand built ceramic boomboxes; and a two-dimensional piece closely depicting the blown-up packaging of 3M brand scotch tape. Upstairs, however, the exhibition delivers on its highly specific title, and delves into more cohesive conceptual concerns. 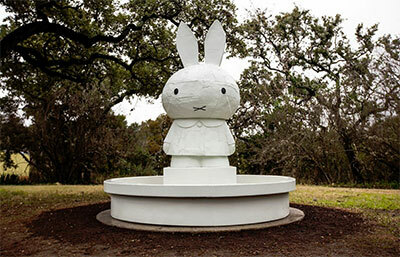 Tom Sachs, Miffy Fountain, 2008. Silicon bronze and paint (three-part catalyzed acrylic, white primer, white base coat, “Xtreme” Flat Finish Klearkote). 108 x 102 x 102 inches. Courtesy Tom Sachs Studio. Here, the tracks playing on Toyan’s continue, now emitted by a selection of the numerous peculiar stereos that dot the gallery. Each of these fit firmly into the frankensteinian Boombox series Sachs began in 1999. They’re crafted according to his peculiar code of building: screws exposed, plywood painted before cutting and construction — everything professional in its way, but raw edged and exposed. Even in that, Sachs seems to be walking the line between high production and something more genuine. One suspects that the connection to our island neighbors is less inspired and more a simple product of mutual goals: A sound system that’s loud, cheap, and quickly constructed, something to build a party around. The connection doesn’t stop there, though; Sachs goes on to reference one of Jamaica’s most well known artists: “Lee Perry would listen to the short range radio off of San Antonio and hear Al Green and he’s such a musical genius, he’d go into the studio and from memory record Love and Happiness but he wouldn’t remember it exactly right so he’d make a dub version. A lot of these sculptures are dub versions.” It’s something said as a boast as much as it is a confession. The concerns Sachs refers to are common among musicians of certain genres. Successful hip-hop, punk, indie, even country artists are caught in a strange place of balancing their new level of resources and status with what got them there in the first place — something genuine, something real, something gritty. Guru’s Yardstyle, and a few other early works exude the same sense of authenticity as a bootleg recording of Lee “Scratch” Perry where others might more closely resemble an over-produced Kanye track. Take Mini Presidential Vampire (2002), a slick construction of ply and metal emblazoned with the presidential seal and supporting a turntable and deck. 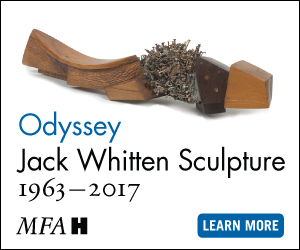 There’s a bong resting on its surface attached to a retractable cable fastened to the sculpture. It looks great, but that bong seems like a prop to imitate subversion and doesn’t really compare to something as genuine as Guru’s immediacy. Fortunately Sachs is aware of the evolution of his works and in recent boomboxes plays with it. Model 28 (2012) might be the most polished among them, and actually reads like a marketable high-end stereo save custom-made plywood BMW logo bolted onto its face. That stereo was made specifically for a posh gallery exhibition, and seems like an appropriate piece to address luxury and hollow status symbols. It acknowledges that the genuine nature that Sachs works are rooted in is now in constant jeopardy because of Sachs’ success and the broad appeal of that original authenticity. That acknowledgment alongside Sachs’ ability to reimagine the same concept in new form, are the two strongest elements keeping the artist’s work fresh. The tension is still there, though, and it’s not helped by the fact that Sachs is a very white man with a very upper middle class background (the tuition for the private high school Sachs attended currently stands at over $30,000) making his living off of the co-opted symbols of marginalized people. Sachs is quick to relate how he had it rough, living in New York working as an illegal welder before his artwork found the spotlight — it’s all too similar to the countless celebrity musicians protesting against some accusation (real or imagined) of being out of touch, no longer connected to the streets. Truth be told, that tension between authenticity and clout — the tension seen both in Sachs’ work and in his speech – is one of the most interesting things about the exhibition. One can only guess if that tension will be exacerbated by the multiple collaborations planned with SXSW, a festival that receives its own fair share of sell-out accusations and concerns of it losing its original independent appeal. In a fast growing, overly gentrified town, those concerns strike close to home. Seth Orion Schwaiger is a critic, curator, and artist based in Austin, Texas, and Glasgow, Scotland. His research interests include the development of arts systems with particular focus on the growth and direction of urban and regional art scenes in relation to larger national and international trends. 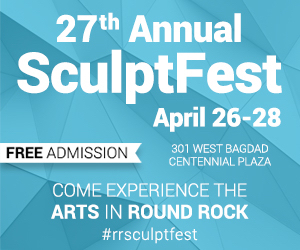 He is a frequent contributor to many publications including Arts+Culture, The Austin Chronicle, Glasstire, New American Paintings, and Sculpture Magazine.